A day after our Sundarbans tour we took the early morning train 300km north-west to Rajshahi. 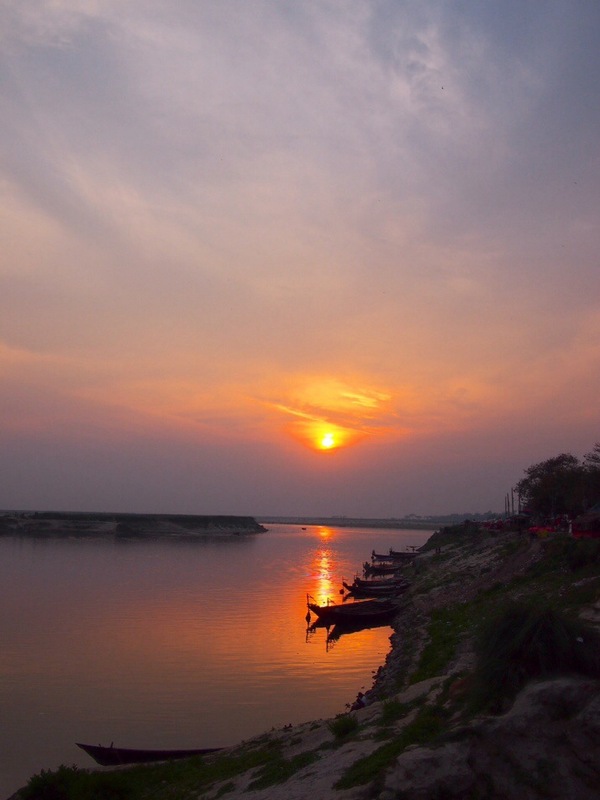 The 7 hour journey was very picturesque passing through lush green countryside and many small towns and villages before crossing the huge Padma River (you might know it by its Indian name, the Ganges) into Rajshahi Division. The windows in Bangladeshi trains open right up so you can lean out and take photos too. Not something that the health and safety people are likely to approve of perhaps, but it added to the fun for us. 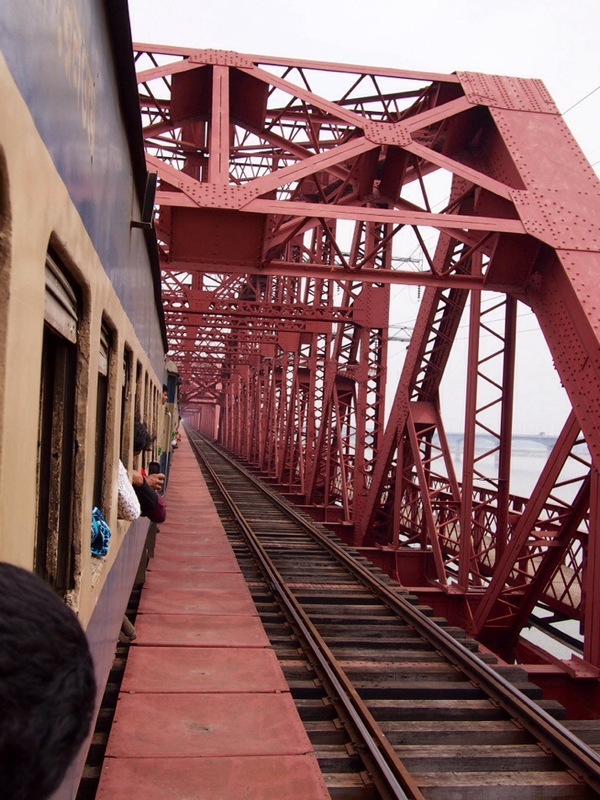 Crossing ‘Harding’s Bridge’ over the Padma River. We were excited to spot signs on the bridge showing that it was built by the Cleveland Bridge & Engineering Company from Darlington, England! I was a little skeptical of such a gushing recommendation but it really was absolutely stunning. 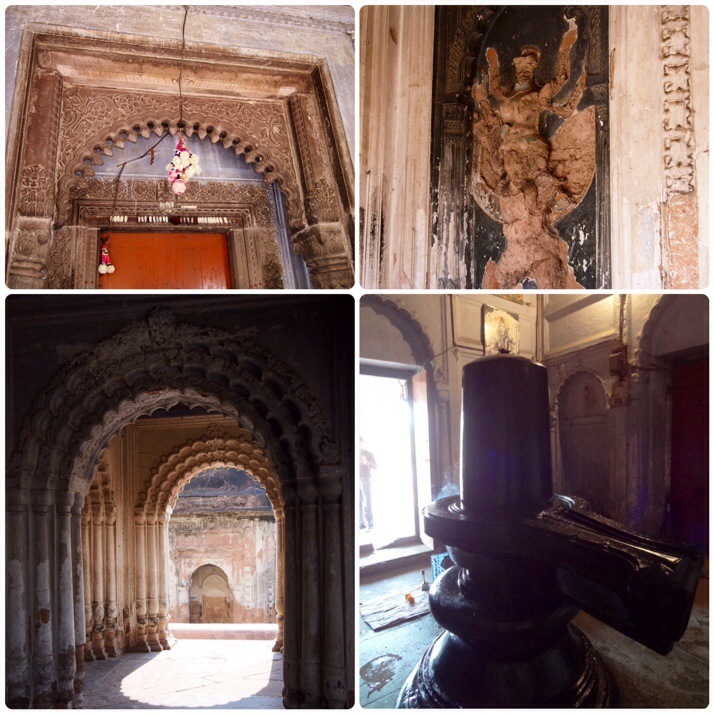 We were given a tour by the caretaker, Mr Bishwana, and it was just temple after temple, almost all well preserved and beautifully decorated with terracotta tiles. 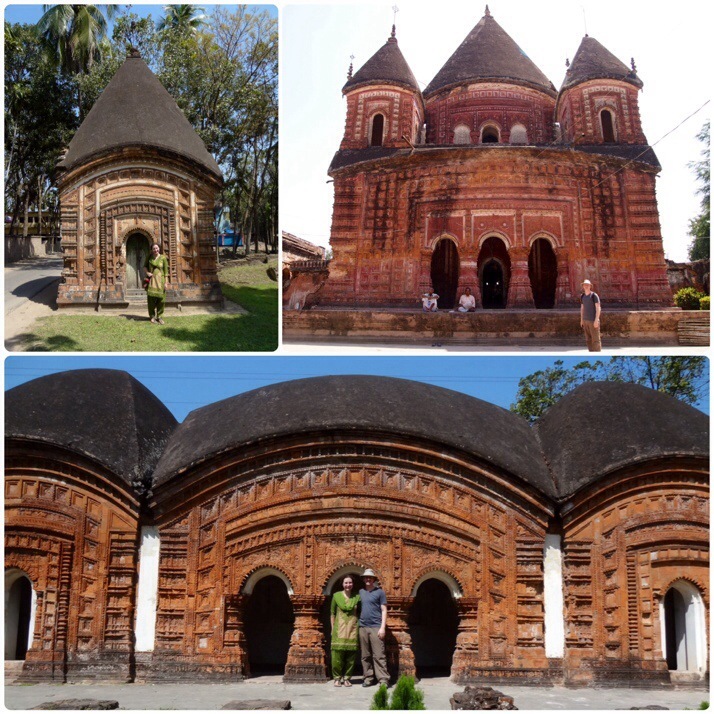 The other five temples that we visited in Puthia varied massively in size and shape but all had similar decoration, covered from top to bottom with terracotta tiles showing characters and stories from Hindu mythology. After about 45 minutes we were so sick of having our photo taken that we just had to leave. The only bright spot was the small boy who befriended us – I’ve never seen anyone look so pleased to receive an orange! 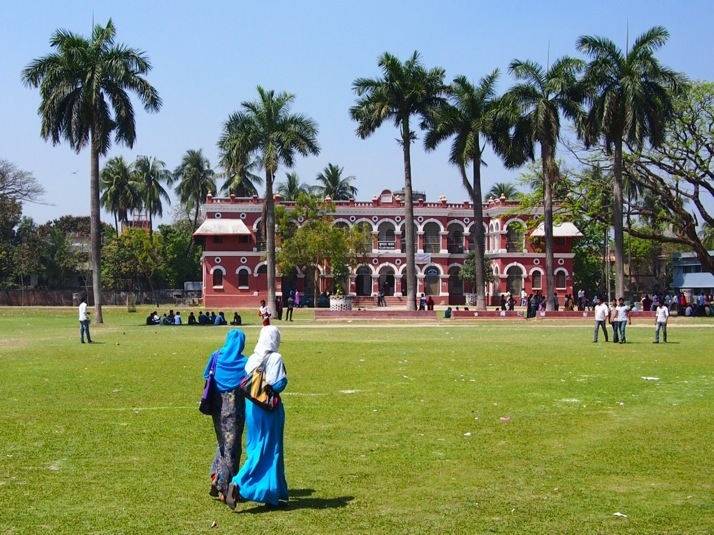 Rajshahi itself is a university city and as such packed with young, chatty students. 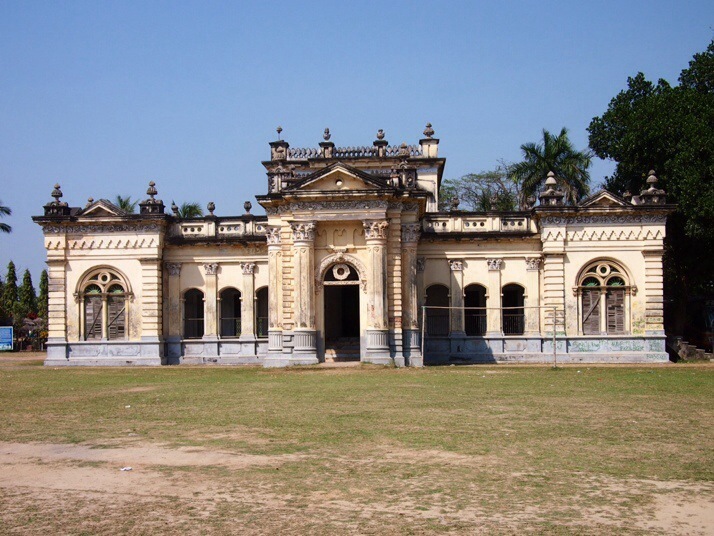 We got a tour around the campus of Rajshahi College and its colonial architecture by a student wishing to practice his English, and an offer to be shown around the university campus by an equally keen student which we declined due to its distance from the city centre. Whenever a local spoke to us about the city they almost always mentioned one or both of the following, the Padma River, and mangoes! 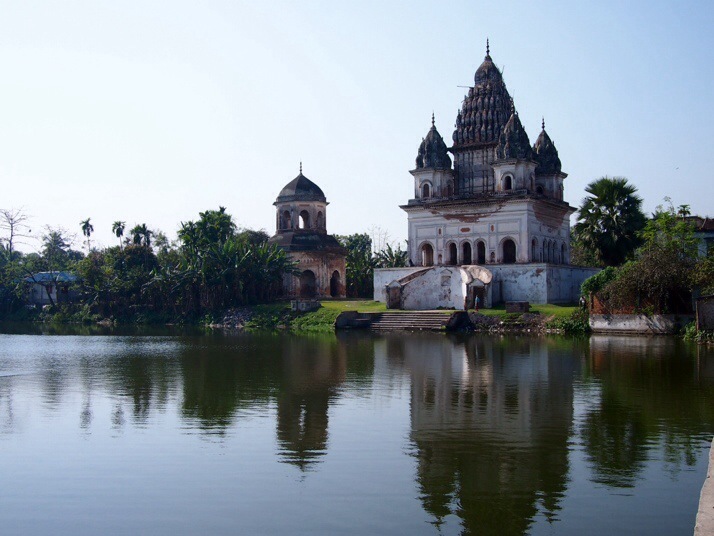 The city is situated on the banks of the Padma and has an attractive promenade along the riverbank which is lively in the evening. The climate of Rajshahi is perfect for mango trees and we saw orchards in the countryside all around the city. The trees were in flower during our visit and although the fruit doesn’t ripen until June we heard that some can be as big as 2kg! 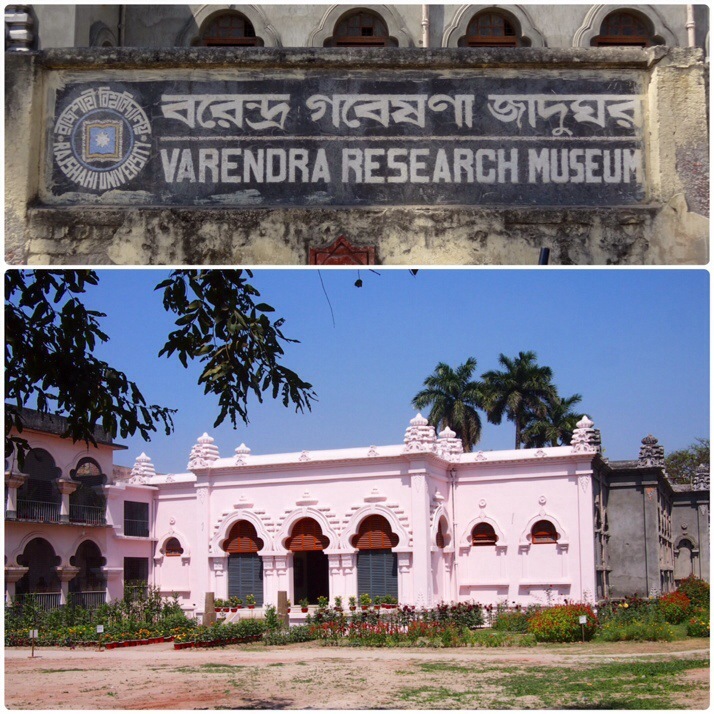 The main sight in the city, other than wandering and looking at the architecture and markets, is the Varendra Research Museum which is managed by the university. It contains an impressive number of artefacts from nearby archeaological sites, in particular some beautiful Hindu carvings. We were again treated to a personalised tour, this time by the museum’s secretary who hovered over us a little bit at first but seemed to relax as the tour went on and told us some stories and history as well as shooing away anyone who started staring at us. 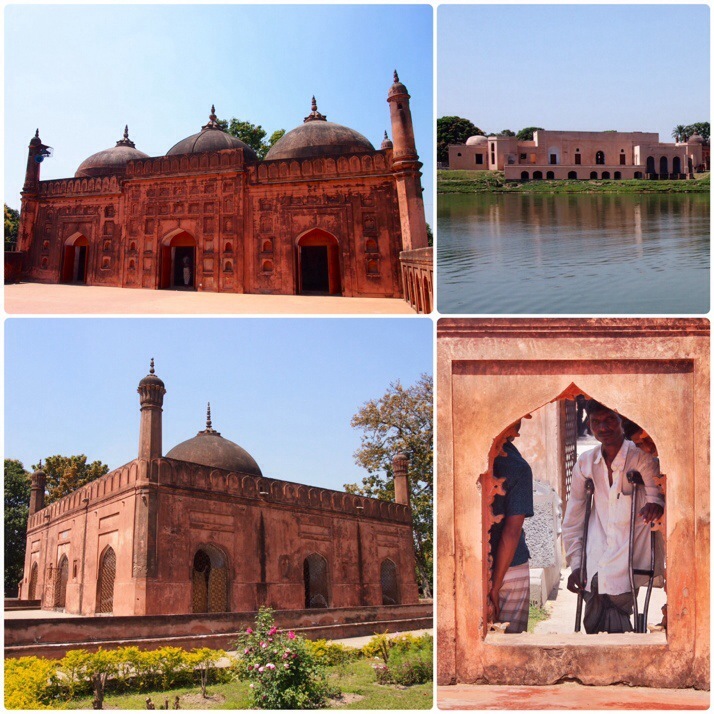 The second day trip that we made from Rajshahi was to Sona Masjid, a vast site spanning 32 sq. km across the border between Bangladesh and India (where it’s known as Gaud). 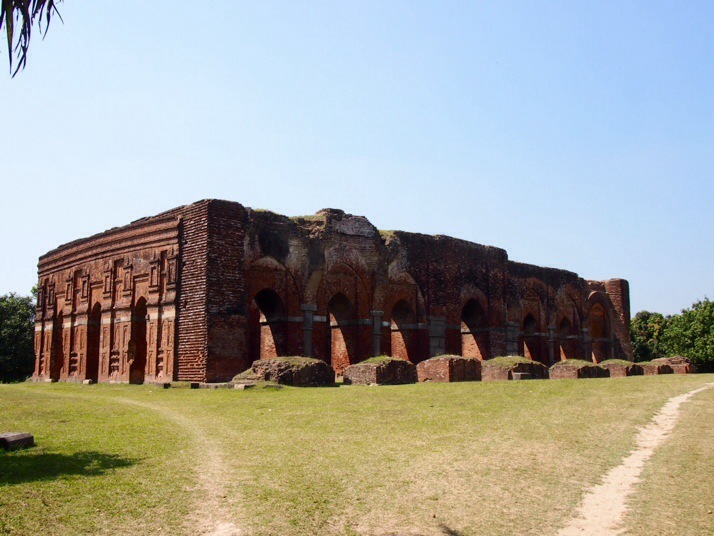 It is the remains of a huge city which was the capital of Bengal for many years. 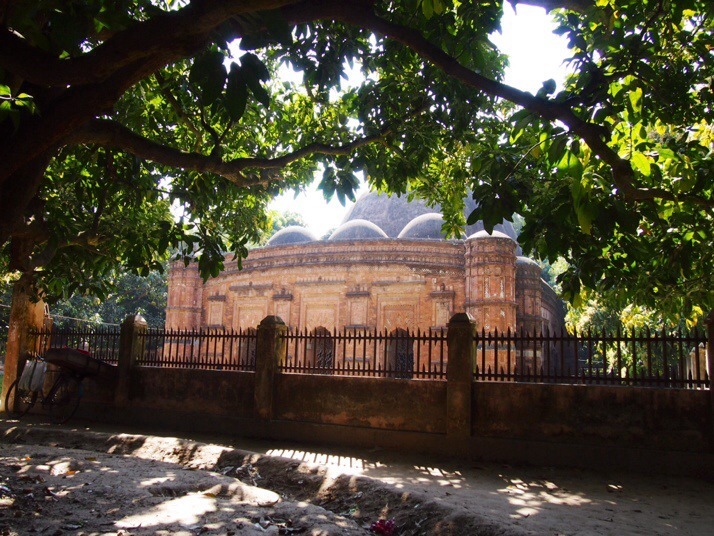 On the Bangladeshi side are a number of well preserved mosques, a palace and a mausoleum, some dating from as far back as the 15th century. According to our guidebook the bus journey was supposed to take 3 hours, but after just 2.25 hours we were ejected at the side of the road beside Chhoto Sona Masjid (Small Golden Mosque). Somewhat shaken by the super fast journey we decided to grab a cup of tea, but at the local tea stand we were soon surrounded by staring men, so we supped up quickly and moved off to the mosque. It’s no longer golden, its name refers to the fact that its domes were once gilded but it is still impressive with stone carvings outside and a cool interior. The mosque’s imam rushed in during our visit, keen to engage us in conversation (and point out the donation box). As we walked down the dusty road to the other two mosques, we were passed by lots of brightly decorated trucks making their way to the official border crossing point. 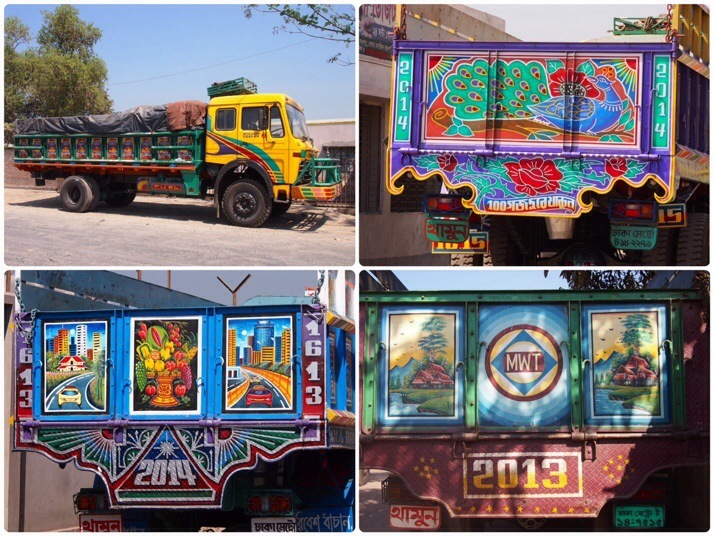 We’ve noticed that all of the trucks in Bangladesh seem to be painted like this, I’m not sure if the colours signify ownership or if there’s some other reason but they’re very cheerful. 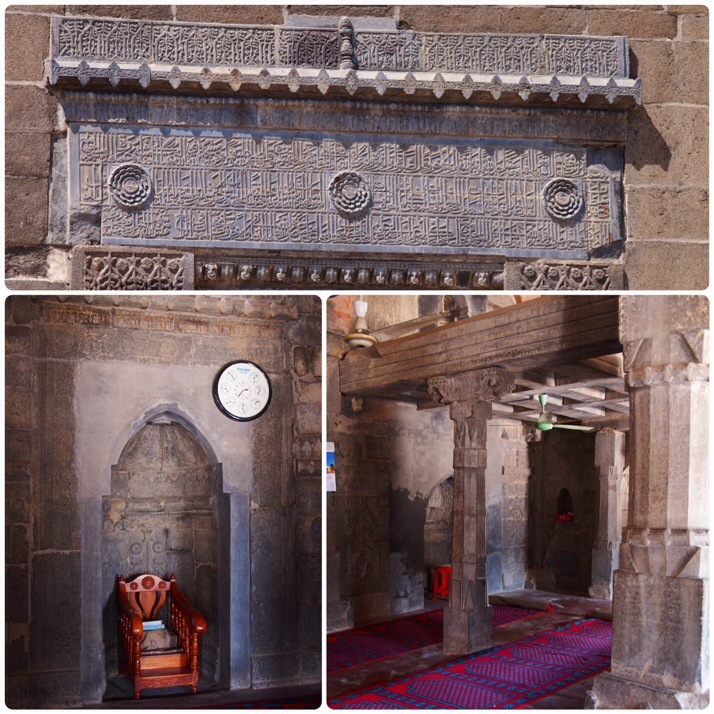 Thankfully both Darasbari Mosque and Khania Dighi Mosque were much quieter and we managed to have a look around in relative peace. It seems strange that so many elaborate and historic mosques are scattered around this area, tucked away in the farmland and miles away from any major centres of population. It made us think about the upheavals that must have happened over the last few hundred years to cause such shifts of people and marvel that these buildings at least survived relatively intact. 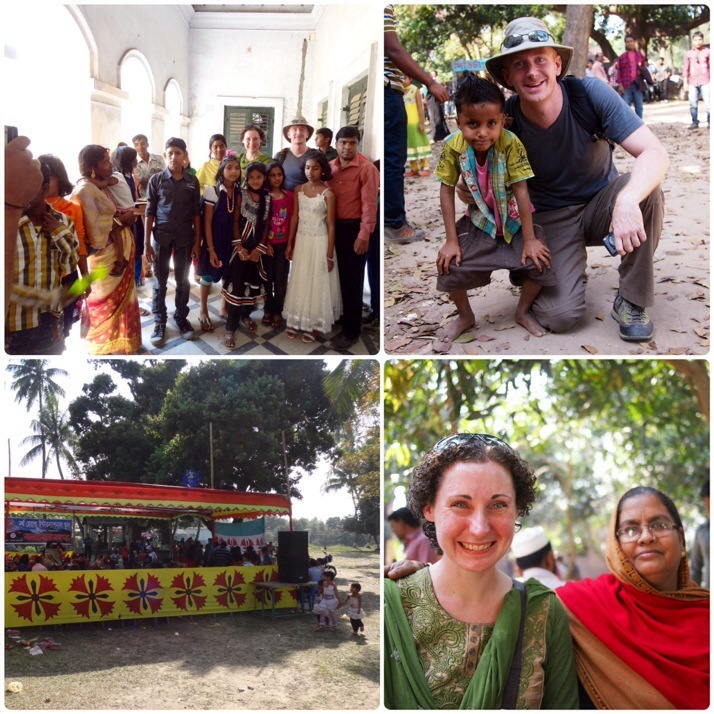 We caught the last bus of the day back to Rajshahi, tired and dusty, but very glad to have made the trip. The bus was busy but fortunately not quite as crazy as the bus that we took in the morning and much closer to the quoted 3 hour duration. 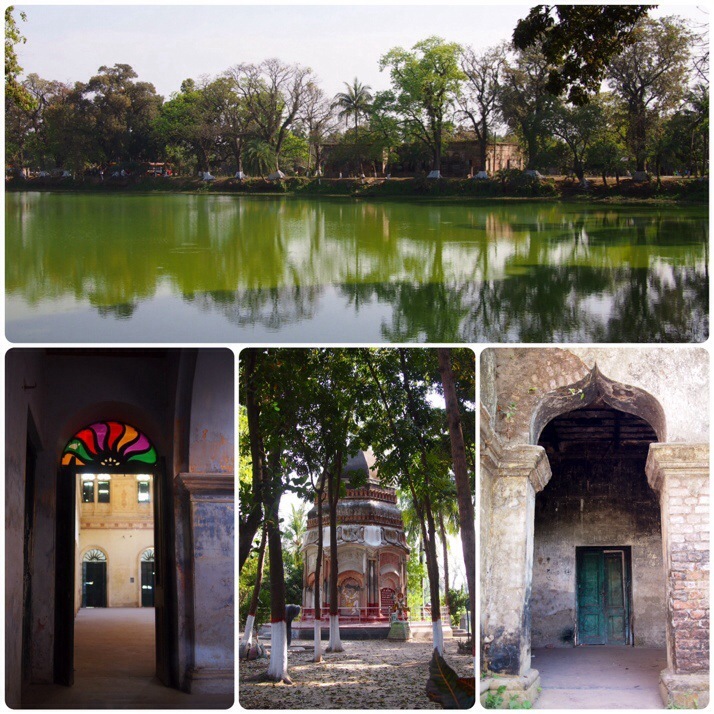 This entry was posted in Places and tagged Bangladesh, mosque, Rajshahi on April 11, 2014 by Julie. Sounds like hassle levels were high in Bangladesh. Yes, just a bit, although I don’t mean to make it sound quite so negative. Everyone was well intentioned and we met some really lovely people over the course of the month, it’s just that when you’re attempting to do a bit of sightseeing and you’re instead confronted with a constant stream of people hoping to have a short chat and then take several photos with you, themselves and different combinations of their family members it can get a bit tiring! 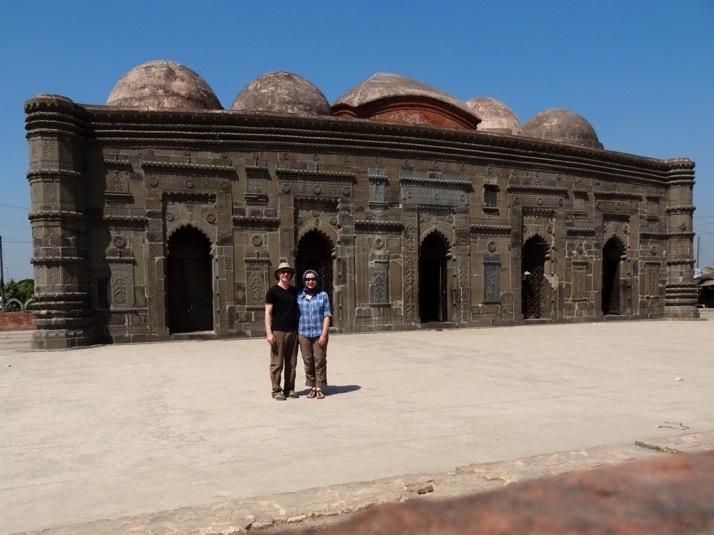 your article about our glorious Mosques Temples and Stupas was awesome and knowledgeable. 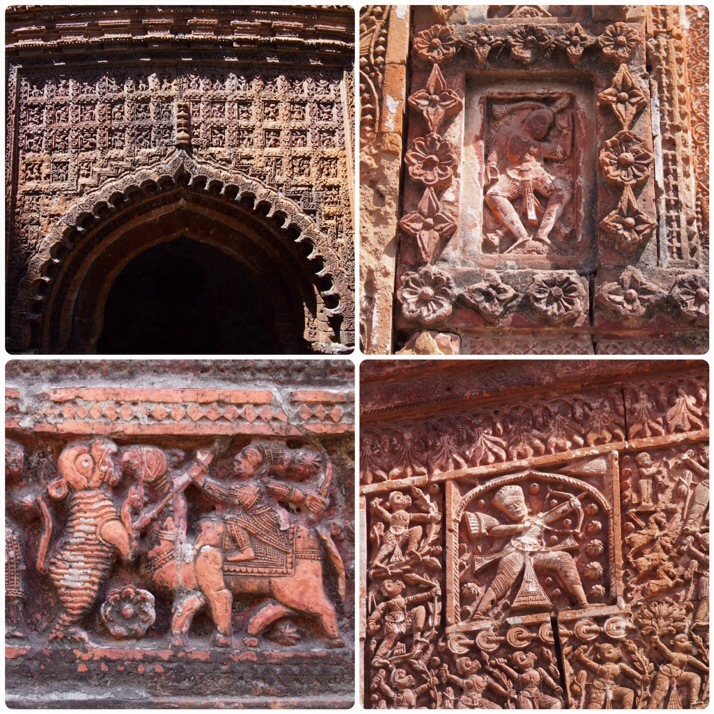 Bangladesh ancient civilization and history was too rich after reading the article travelers inspired to expedition to the glory of North Bengal historical sites. Thank you for your comment. 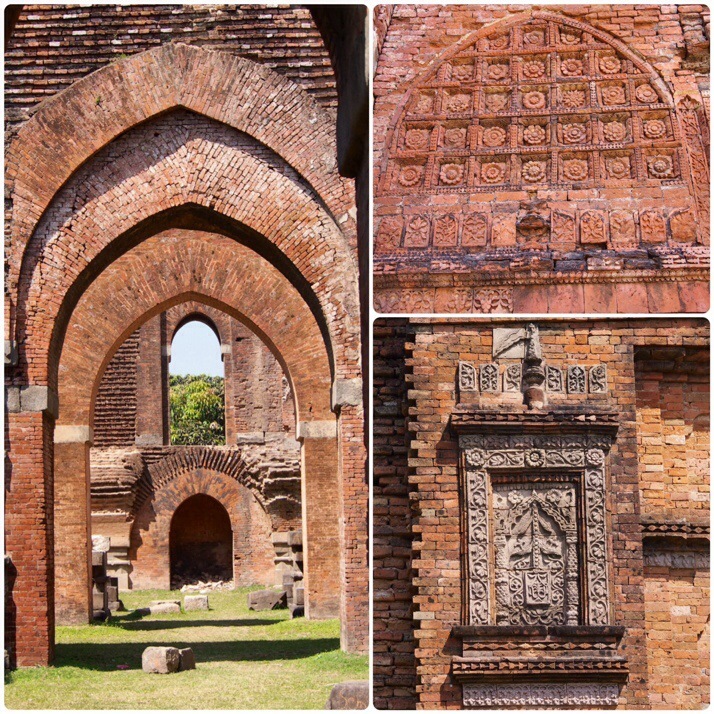 We found the history of the sites we visited in Bangladesh to be fascinating.